6222 ✉ 7 12 Pfg. 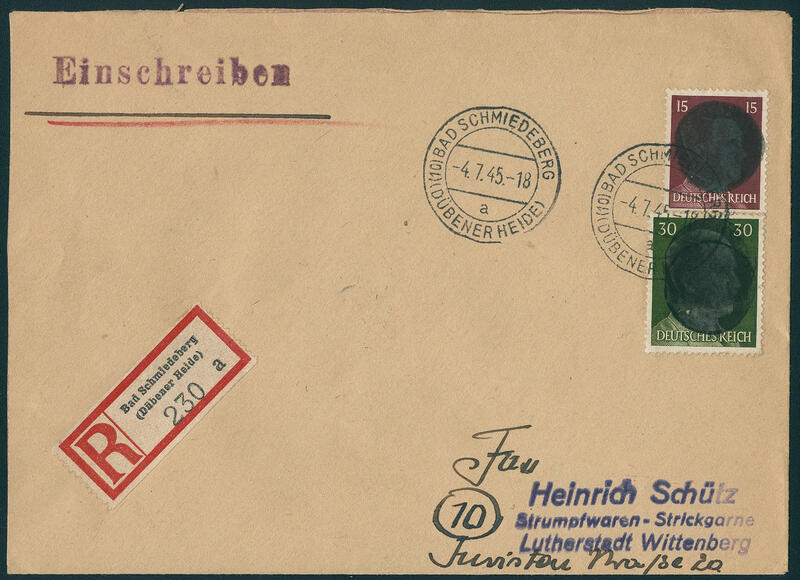 First issue of stamps for Germany after WW II., American printing, fresh colors and in perfect condition as correctly franked single franking on very nice commercially used cover from \"NIEDERSACHSWERFEN South Harz 3.9.45. 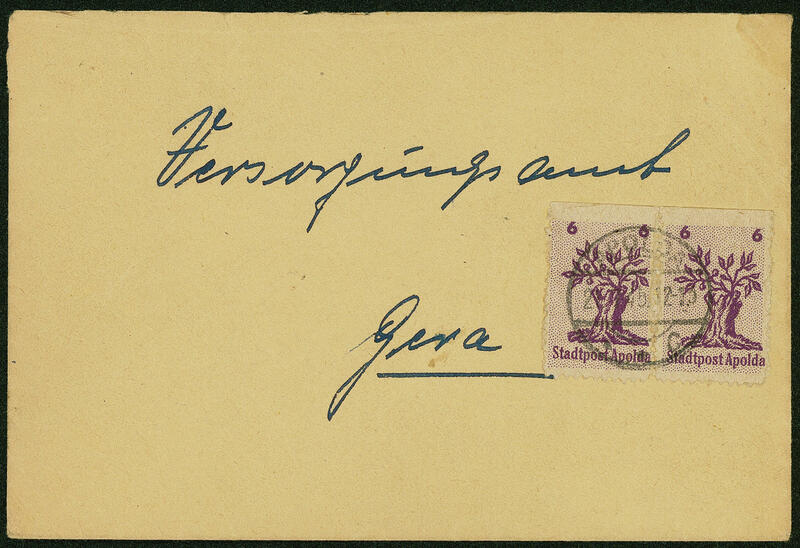 \" to Glauchau. This city belonged since July 1945 to the Soviet areas occupied by the enemy. It arrived however the stamps of the British zone to come into use. Commercially used letters hereof are extraordinarily rare! 6223 ✉ American occupation Thuringia, 42 Pfg. Hitler without black over painting on censorship cover from \"WINDISCHLEUBA over ALTENBURG 14.5.45\" to Rösrath. 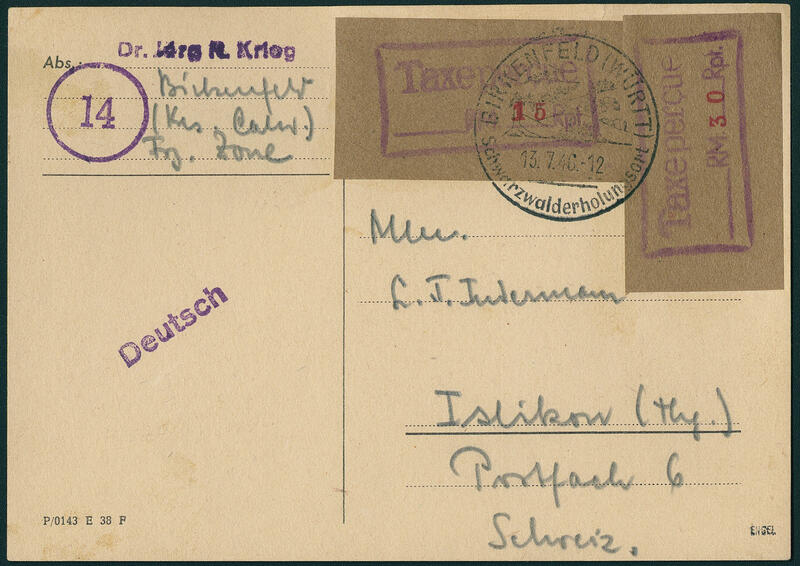 At the beginning of July 1945 the Americans left Thuringia and presented the letter in Munich the censor office (Riemer A100) before, due to of the missing expert cancel was the document once again in Bonn one censorship underwent and with the rarely, green censorship stamp (Riemer B5 no. 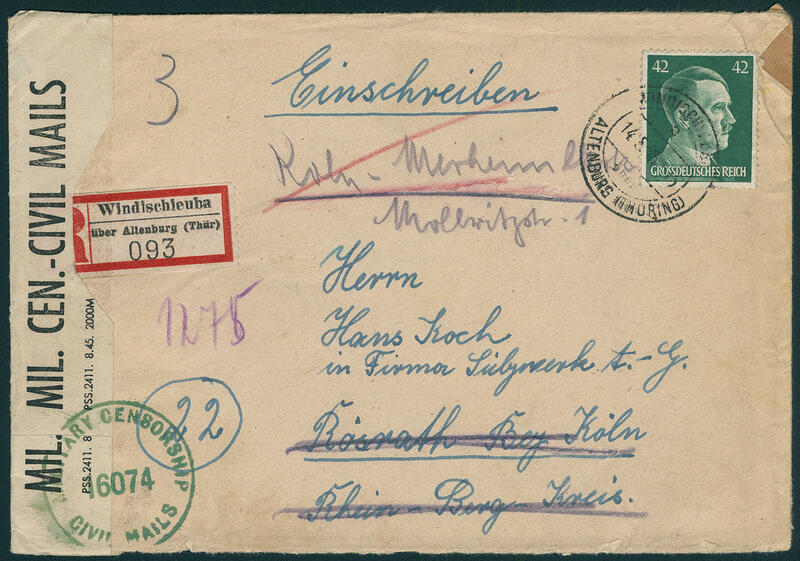 16074) provided, afterwards the forwarding took place via Rösrath to Cologne Merheim with arrival postmark. Major rarity! 5879 ✉ 2II 20 Pfg., frame format 17, 5 : 14 mm, label stamp fresh colors and in perfect condition as extraordinarily scarce commercially single franking on cover with two ring cancel \"ALTENTREPTOW 6.8.45. \" to Wesenberg. There are very few commercially used letters have become known. A Top-rarity of this area! Expertized Richter, photo expertize Zierer BPP. 5880 ✉ 1I,3I 5 Pfg., 8 Pfg., background to the top, in perfect condition on commercially used cover, slight traces, about 1 Pfg. 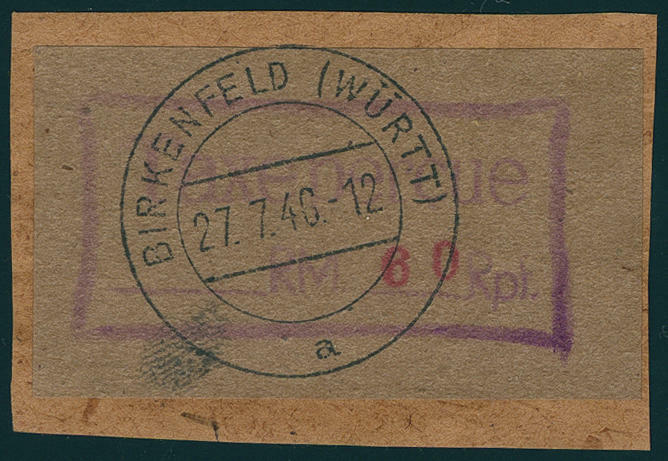 Overfranked, from \"APOLDA 14.8.45. \" to Weimar. An extraordinary document! 5881 ✉ 1II 5 Pfg. 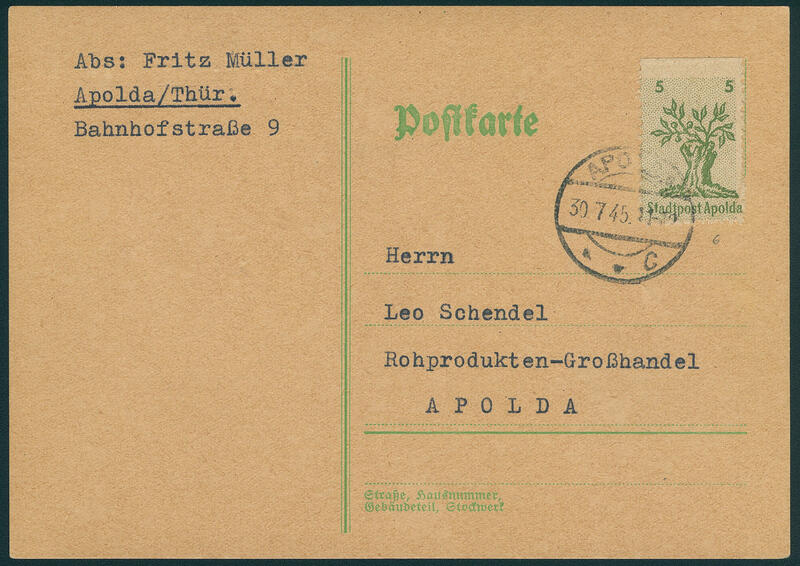 Green, type II, in perfect condition as correctly franked single franking on commercially related local postcard from \"APOLDA c 30.7.45. \". Very rare! Expertized shrub. 5882 1IIU 5 Pfg. Postal stamps 1945, four sides with wide margins unperforated, in perfect condition mint never hinged, Michel undervalued, expertized Zierer BPP. 5883 ✉ 2 6 Pfg. Violet, vertical pair as correctly franked multiple franking on decorative commercially used cover with bridge cancel \"APOLDA c 30.7.45. \" to Gera. The postal service traffic inside of the Regional Directorate of Posts Erford was first three days before at the 17.7.1945 again received. Very rare! Photo expertize Harder BPP. 5884 ✉ 2II 6 Pfg. Violet, background downward, horizontal pair as correctly franked multiple franking on commercially used cover from \"APOLDA 27.7.45. \" to Gera. Very rare! 5885 ✉ 3I 8 Pfg. 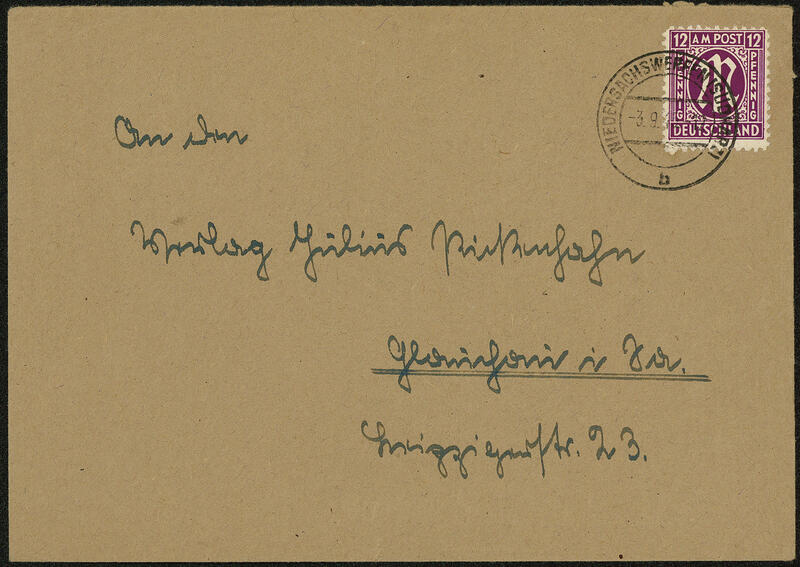 Brown orange, type I, in perfect condition from left margin of sheet as correctly franked single franking on commercially used local letter from \"APOLDA c 23.7.45. \", very rare, expertized shrub. 5886 ✉ 3II 8 Pfg. Pale orange red, type II, in perfect condition from lower margin (there cut) as correctly franked single franking on beautiful, commercially used local letter from \"APOLDA 26.7.45. \". In this kind an extraordinary document! 5887 ✉ 2/4,11 4 Pfg., 5 Pfg., 6 Pfg. And 30 Pfg. Hitler with black over painting from Bad Schmiedeberg, 30 Pfg. 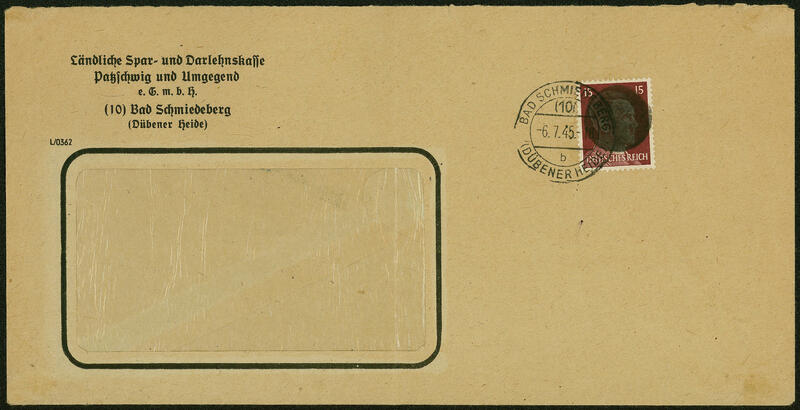 Minimal shaded tips of the teeth, on decorative registered cover from \"BAD SCHMIEDEBERG 14.7.45\" to Wittenberg Luther town with arrival postmark. 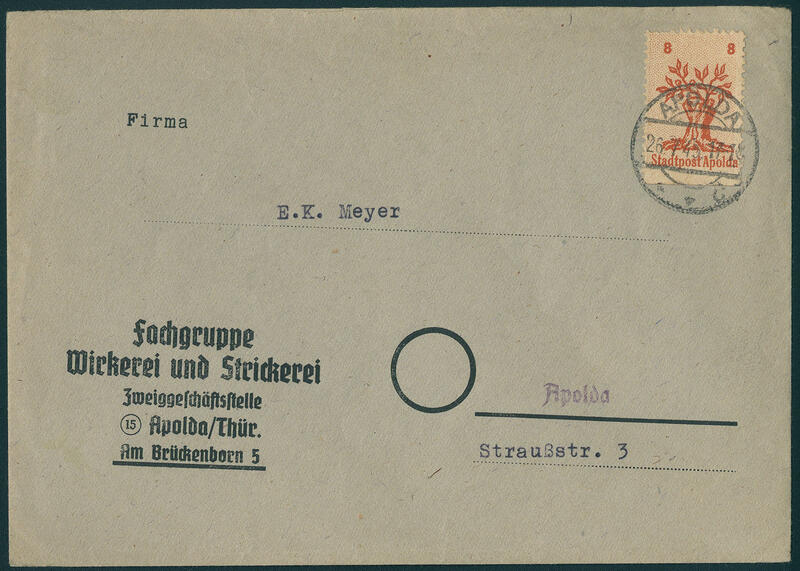 Extremely decorative franking and in this kind a rarity of the German local issue! Michel 3000,- €. 5888 ✉ 6 10 Pfg. Hitler with black over painting from Bad Schmiedeberg, fresh colors and in perfect condition as extremely rare correctly franked single franking on postcard from \"BAD SCHMIEDEBERG 30.6.45. \" to Wittenberg Luther town with detailed text. A significant rarity of this area in utterly perfect condition! Photo expertize Dr. Penning BPP. 5889 ✉ 8 15 Pfg. 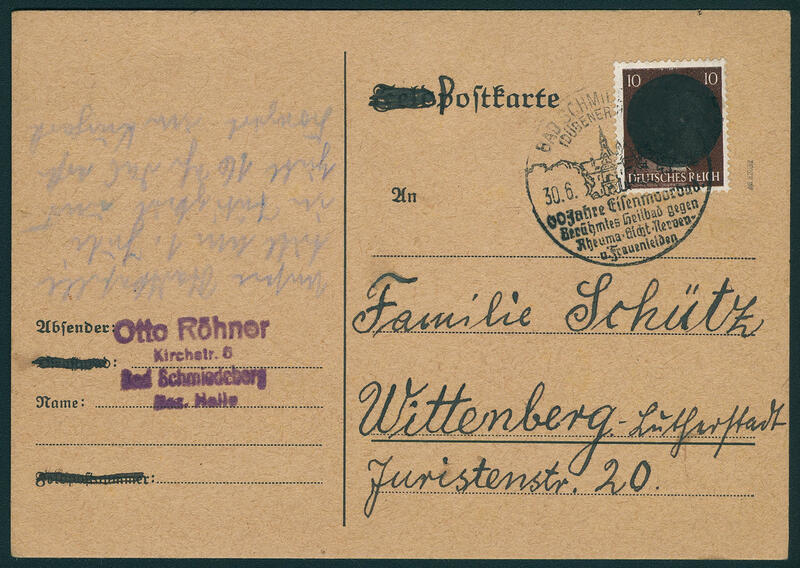 Hitler with black over painting, in perfect condition on correctly franked commercially used cover with special cancellation \"BAD SCHMIEDEBERG 28.6.45. \" to Wittenberg Luther town. 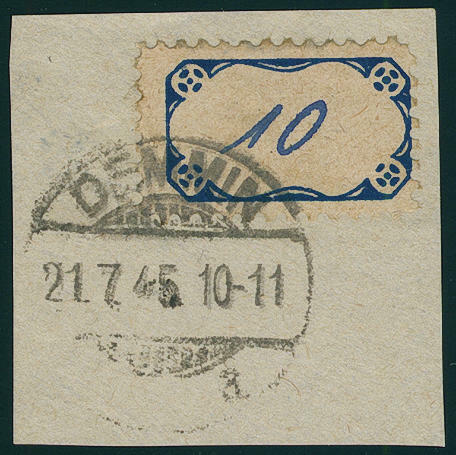 In Bad Schmiedeberg were said to be heightened postal tariffs, so that here 15 Pfg. In lieu of 12 Pfg. For a long distance cover pasted up become must. 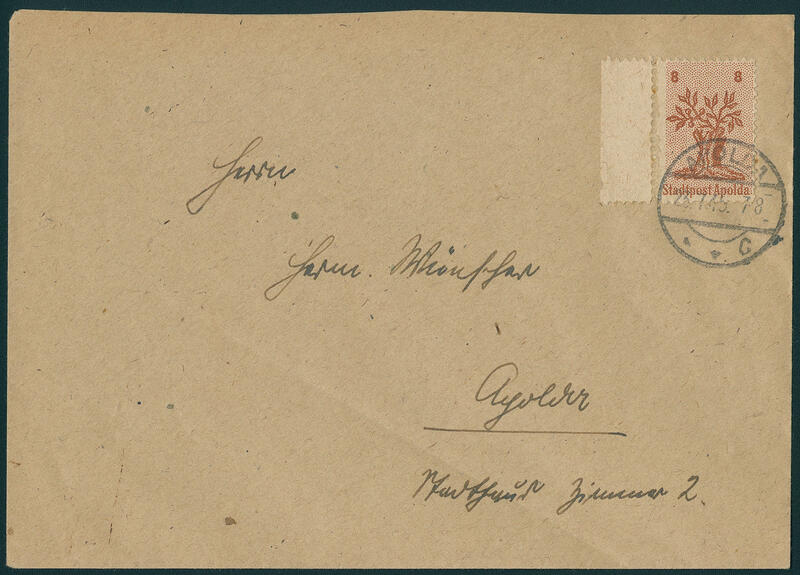 Commercially used letters hereof are very rare. According to the photo expertize of Mister Pötzsch from the year 1994 are only six documents in this kind have become known. 5890 ✉ 8 15 Pfg. Hitler with black over painting on commercially used folded cover from \"BAD SCHMIEDEBERG 6.7.45. \", very rare, photo expertize Arenz BPP. 5891 ✉ 8,11 15 Pfg. And 30 Pfg. Hitler with black over painting from Bad Schmiedeberg, as well the 30 Pfg. 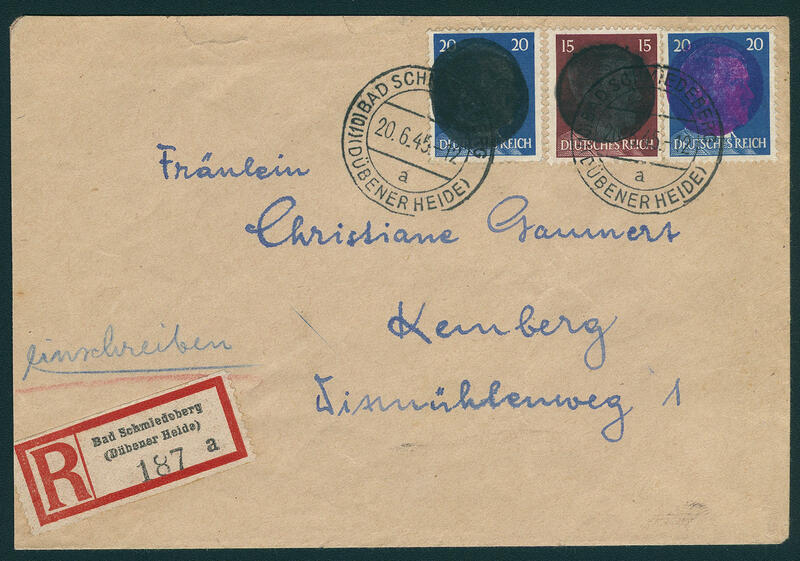 Double black, as correctly franked franking on very nice, faultless registered cover \"BAD SCHMIEDEBERG 4.7.45. 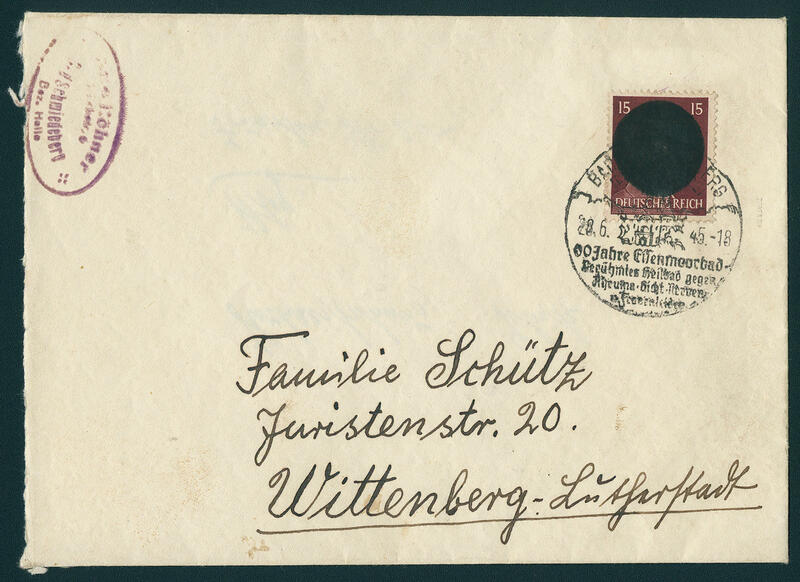 \" to Luther town Wittenberg with arrival postmark. These postage step was in Bad Schmiedeberg first at the beginning of July introduced become. There are only few registered covers in this kind have become known! Expertized Zierer BPP. 5892 ✉ 8,9a/b 15 Pfg. Carmine brown with black overprint, 20 Pfg. With double black overprint, as well 20 Pfg. 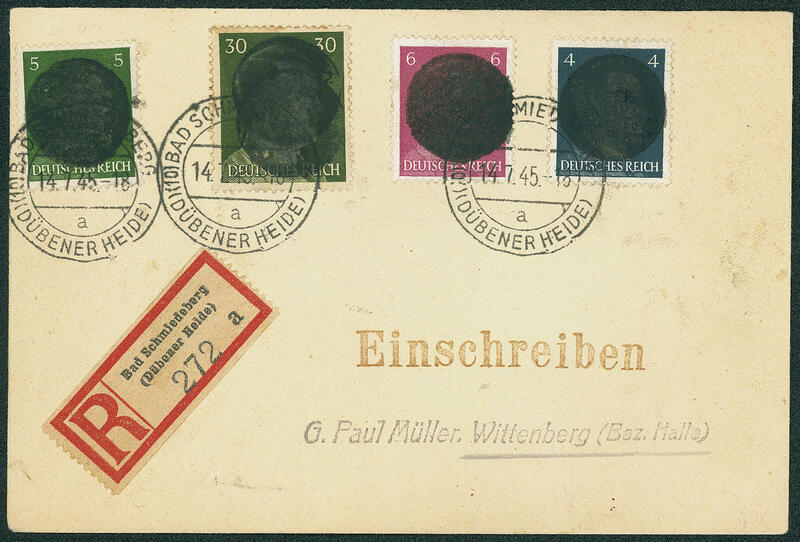 With blue overprint, in perfect condition on registered cover, slightly shortened and above a little rough opened, with two ring cancel \"BAD SCHMIEDEBERG 20.6.45. 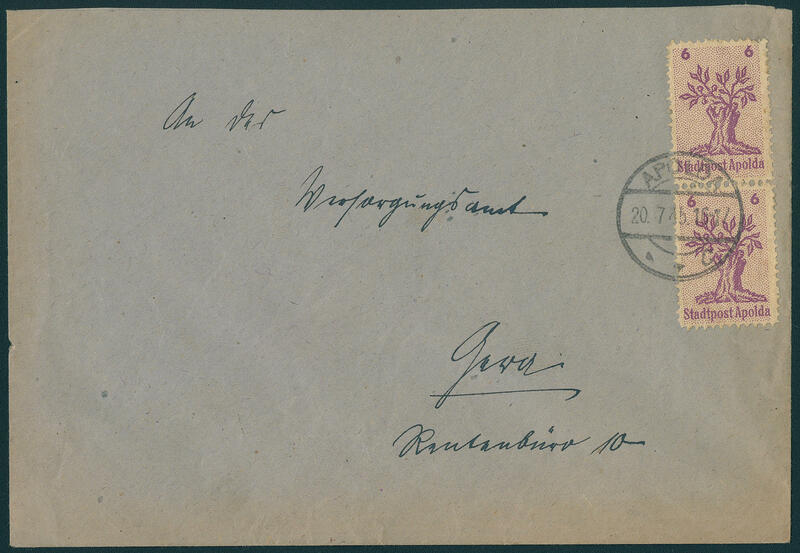 \" to Kemberg with arrival postmark. A decorative and extraordinarily rare document! Expertized Arenz BPP. 5893 ✉ 5II,8II 15 Pfg. And 30 Pfg. 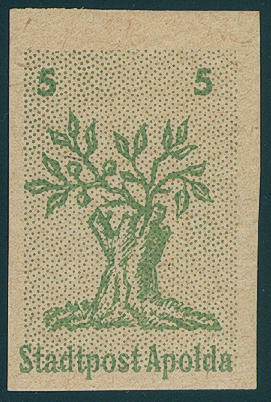 Fee label 1946, the good type II, both values fresh colors and with wide margins on postcard with clear special cancel \"Birches field 13.7.40. 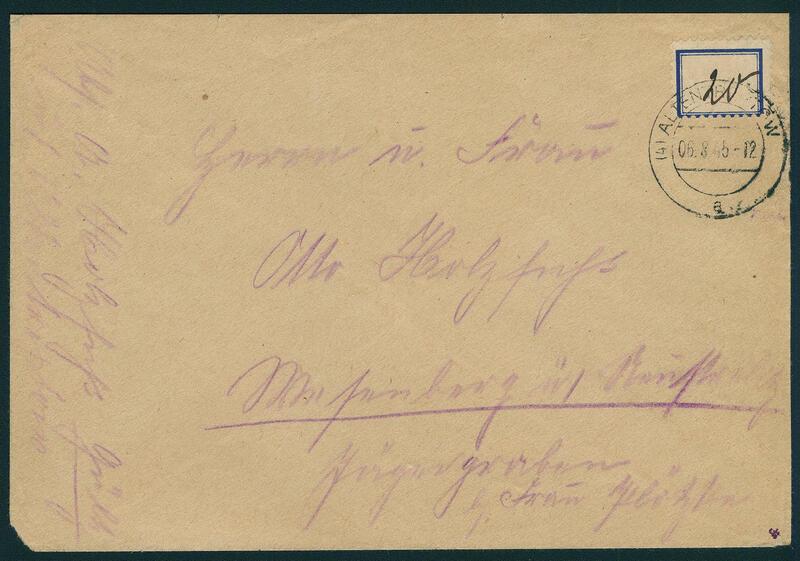 \" addressed to Switzerland. A very scarce issue! Expertized angel. Michel 1600,- €. 5894 ∆ 10II 60 Pfg. Fee label 1946, the good type II, large margins all around on piece with clear two ring cancel \"Birches field 27.7.46. \". Michel 600,- €. 5895 ∆ 3 10 Pfg. 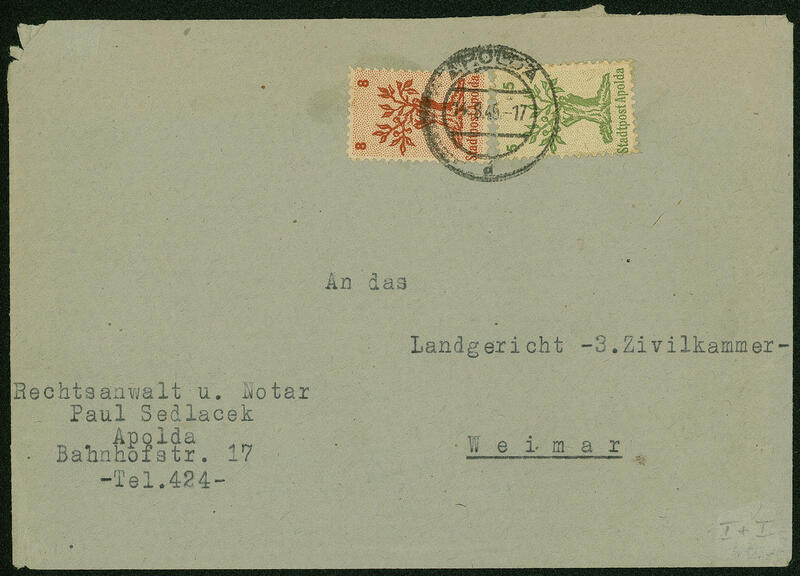 Blue, label stamp, fresh colors and in perfect condition on very nice letter piece with postmark \"DEMMIN a 21.7.45. \", expertized Sturm BPP. Michel 900,- €. 5896 ✉ 4 20 Pfg. 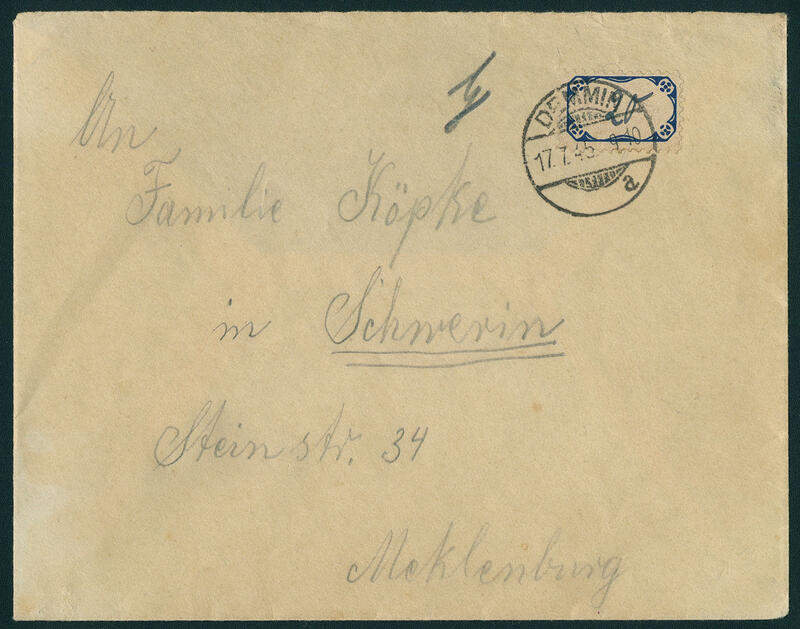 Blue, fresh colors and in perfect condition as very nice correctly franked single franking on cover without sender lid, with neat postmark \"DEMMIN\" to Schwerin / Mecklenburg. There are only few commercially related covers from this known! Photo expertize Thom BPP.